It occurs in large river systems. 48″ x 12″ x 12″ (120cm x 30cm x 30cm) – 110 litres, though larger is preferable. The decor used is not critical but the fish must be provided with some hiding places. Driftwood pieces arranged to form shelters, flowerpots and lengths of pvc piping can all be used. You will see it more often if the surface is covered in floating plants to cut down the light reaching the substrate. An unfussy feeder accepting most small live, frozen and dried foods. Try to keep the diet varied. A robust but relatively peaceful catfish that is an ideal bottom dweller in communities of larger species. Smaller fish will be eaten, however. Good tankmates include some of the larger barb species, such as Tinfoil or Lemon-finned, robust cichlids and loricariids. 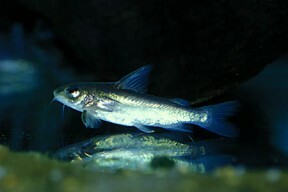 It can be maintained in groups in larger aquaria, but provide each fish with a refuge to call home. There currently exist no reports of captive breeding this species. Rita species are not often seen in the hobby. When available, R. kuturnee makes a fine bottom dweller for communities containing other robust species.